Nest apartment renovated in a Multi-function six-rooms apartment, using unique movable mechanical floors. 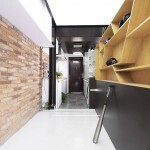 The project is for a young couple in Beijing, who need to renovate their small apartment. 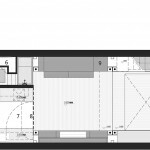 This is a very small room with limited height and space which has no any further extension. The ventilation and daylight condition is terrible. All different kinds of function are missing from the space. All these disadvantages make the young life in Beijing disordering and frustrating. 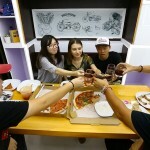 However it is the normal lifestyle for many young people in Beijing. 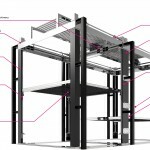 Because of all these problems, designer chooses to invent a special movable mechanics floor plate. 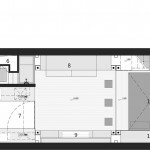 By moving the floors up and down, one can have different rooms fitting different functions. 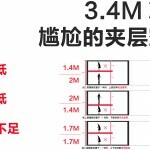 By controlling those 2 floors in different height, one can achieve different spatial quality. Based upon different heights, we also designed different folding furniture which could be transformed to different functions, which are living room, gym, movie theaters, bedroom, multiple living and study room. 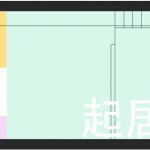 One can transfer the layout according to different functions. 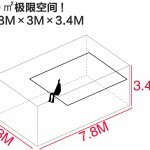 In the living room mode, 2 floors can ascend to the highest point, which will give a 2.8m height space for living. Together with folding furniture, one can have all kind of functions based upon ones need. 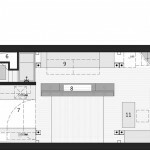 The dining room mode also use this height. By pulling out the special designed table under the tv, combining the small boxes, one can have a workable dinning room for 6 people. 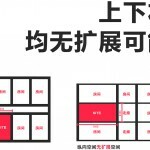 The gym mode could be made by pulling out the tv cabinet, behind which is the gym area for users with the shelves to put up all gears. 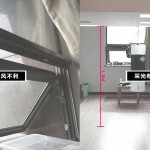 During this mode, the floor next to the window is moving down to 0.45m height. In this way the floor plate itself become a bed. 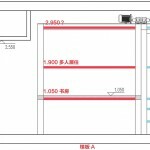 The same floor plate could also rise to 0.75m. One can use it as seats for the screen of the theater mode. When the both 2 floor plates reach 1.05m, one can have the study room mode. By combining the openable cabinet, we have a good study room. Meanwhile we also put a tatami tea room next to the window for great sunlight and fresh air. 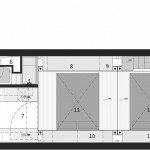 When the both floor plate are up to 1.9m, we can have a multi living space for both upper level and bottom level. 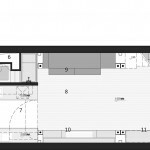 The room could be transformed to a small home hotel. 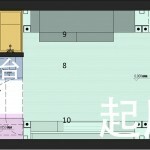 This movable floor plate utilize a well adopted tech in the industry field. It is called screw leveling technology.c. 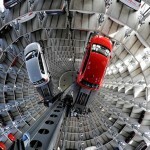 This is invented by Chinese architect Zhang Haiao and German engineer Tobias. 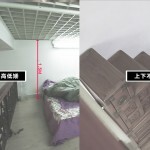 By rotating the main screw stick, one can move the floor plate up and down quietly and safely. The most important of all, the whole system could be autolocked if the power is down during the operation. 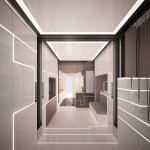 Another important factor of this room is the smart system embedded to to the apartment. There are three main parts including big data analysis, safety control and consumption analysts. It will collect all data from the house to show up on the screen and be sent to ones phone and tablet. The users could monitor the situation easily. The most important factor of the system is the safety. One only you control the system by entering the passcode. We also use the laser beam system to detect the moving subject under the floor plate. There is also an emergency button next to the control panel. All these measures could make sure that the whole system is extremely safe for the living environment. One can also control the light and curtain by using their phones. The foggy glass is used in the door. 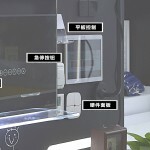 There is also a smart mirror for listening music. 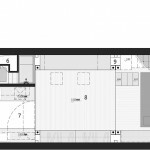 Architect design a dignity life in the big city in such a small living space. 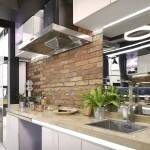 Project team: shanghai huadu architecture and urban planning co.,ltd. 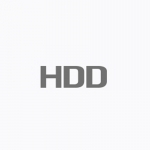 Mechanical design team: Global Retool Group + Hexin technology co., led. 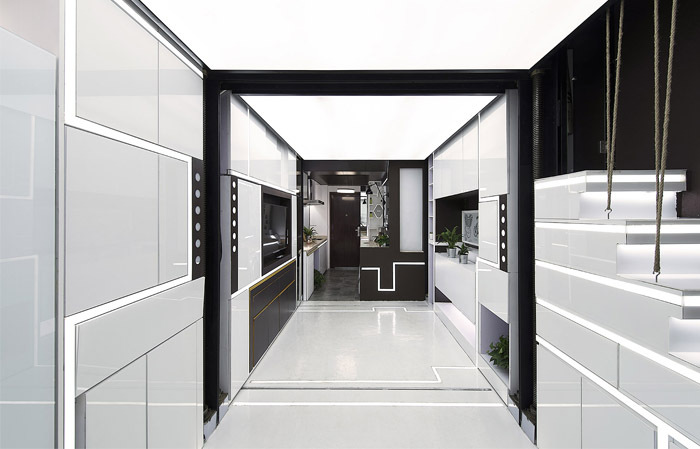 Smart home design team: LIANGYI smart technology co.,ltd. Floor material provider: Jilin Yinhao gongmao co.,led .